See the full Terms and Conditions . After that, your APR will be 16.24% to 28.24%, based on your creditworthiness. This APR will vary with the market based on the U.S. Prime Rate. After that, your APR will be 16.24% to 28.24%, based on your creditworthiness. This APR will vary with the market based on the U.S. Prime Rate. A balance transfer request must be made within 120 days from account opening to qualify for the introductory APR. Read the Wells Fargo Cash Wise Visa Card Agreement. Credit card subject to credit qualification. Generally, we will apply your minimum payment first to lower APR balances (such as purchases) before balances with higher APRs (such as cash advances). View the complete Go Far® Rewards Program Terms and Conditions. Zero Liability protection to protect you from liability for unauthorized transactions when you report them promptly. Alerts to track purchases and receive notifications of irregular or suspicious activity. Cell Phone Protection helps protect your cell phone from damage or theft when you pay your monthly cell phone bill with your eligible Wells Fargo consumer credit card. Review the Visa Guide to Benefits (PDF) to learn more. Auto Rental Collision Damage Waiver provides auto coverage for damage due to collision or theft. Review the Visa Guide to Benefits (PDF) to learn more. What do I need to apply online and what information will you review? When you open an account, we will ask for your name, address, date of birth, and other information that will allow us to identify you. We may also ask for your driver’s license or other identifying information. We review the information provided on your application and other information about your creditworthiness. What should I expect after I apply online? Upon submitting the online application, you will receive the status of your application on the confirmation page and we will send you a confirmation email. If we are able to provide you an approval, the confirmation page and email will also display your credit limit. If we need more time to review your application, you will receive an application ID and a phone number that you can call to check your application status. Do I need to sign up for Go Far® Rewards? This card automatically comes with Go Far Rewards and there is no need to sign up. Learn more about Go Far Rewards. How do I use my credit card for Overdraft Protection? You must have a Wells Fargo checking account and a Wells Fargo credit card to use this optional service. If you already have a Wells Fargo credit card, but you do not have a Wells Fargo checking account: apply for a checking account and select the Overdraft Protection box on the application. Subject to credit qualification. If you already have a Wells Fargo checking account, call 1-800-642-4720 to enroll. You agree that we may consider you for a Visa Signature credit card if you qualify. If you opened a Wells Fargo Credit Card within the last 15 months, you may not be eligible for introductory annual percentage rates, fees, and/or bonus rewards offers. See important exclusions below (on page 2 if printed). Unless an introductory or promotional APR is in effect, we will add a “Margin” to the U.S. Prime Rate to determine your standard variable APR. For each billing period we will use the U.S. Prime Rate, or the average of the U.S. Prime Rates if there is more than one, published in the Money Rates column of The Wall Street Journal three business days prior to your billing statement closing date. If the U.S. Prime Rate is not published or is otherwise unavailable, whether temporarily or permanently, we will select a substitute index that we believe, in our sole discretion, to be similar to the U.S. Prime Rate. The U.S. Prime Rate is 5.50 percentage points as of 04/22/2019. The "Margin" for purchases and balance transfers will be 10.74 to 22.74 percentage points, based on your creditworthiness. This application is for a credit card with Wells Fargo Bank, N.A. You certify that all information provided is true, correct, and complete and that you have the legal capacity to enter into this contract. The Bank is authorized to verify or check any of the information given, to obtain credit reports on you and to make Overdraft Protection advances if you requested that feature. You authorize the Bank to obtain information from others to investigate your credit, employment and income history and state records including state employment security agency records and to report information regarding your account to consumer reporting agencies. You agree that the Bank will determine the amount of credit extended, as well as which product you qualify for, based on the Bank's review criteria. If you do not qualify for the product or pricing requested or for the lowest pricing offered, you authorize the Bank to grant you the product and pricing for which you do qualify. You agree to be bound by the terms and conditions of the Agreement, which will be sent to you, and understand that the terms of your account may be changed at any time, subject to applicable law. You hereby stipulate to the terms of the arbitration program described in the Agreement. You understand and agree that you will be liable for payment of all amounts owing on the account. The minimum credit limit, provided you meet the terms and conditions of this offer, is $1,000.00. To qualify for the $200 cash rewards bonus, a total of at least $1,000 in net purchases (purchases minus returns/credits) must post to your account within 3 months from the date your account is opened. The bonus cash rewards will show as redeemable within 1-2 billing periods after they are earned. Cash advances and balance transfers do not apply for purposes of this offer and may impact the credit line available for this offer. ATM transactions, cash advances of any kind, balance transfers, SUPERCHECKS™, cash equivalents such as money orders and prepaid gift cards, casino gaming chips, wire transfers, off-track wagers, lottery tickets, or bets or wagers transmitted over the internet, fees or interest posted to a linked account, including but not limited to returned payment fees, late fees, and monthly or annual fees, do not earn cash rewards. Refer to the Summary of the Go Far® Rewards Program Terms and Conditions and Addendum to the Go Far® Rewards Program Terms and Conditions for details. You will earn an additional 20% mobile wallet transaction bonus cash reward above the base earn of 1.5% on net purchases (purchases minus returns/credits) only, for a total of 1.8% cash rewards during the first 12 months from the date the account is opened. These bonus cash rewards are only earned on transactions originating from your Wells Fargo Cash Wise Visa® Card when transactions are made using a qualified mobile wallet (for example, Apple Pay® or Google Pay™). All other transactions will be processed at the base earn rate of 1.5%. To review the mobile wallets that qualify for the 20% mobile wallet bonus, go to wellsfargo.com/cashwisemobilewallet. Available to both citizens and permanent resident aliens of the U.S.
You will earn an additional 20% mobile wallet transaction bonus cash reward above the base earn of 1.5% on net purchases (purchases minus returns/credits) only, for a total of 1.8% cash rewards during the first 12 months from the date the account is opened. 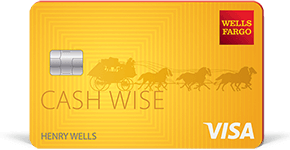 If your account is upgraded to the Wells Fargo Cash Wise Visa® Card, you will earn the mobile wallet rewards bonus during the first 12 months from the date your account is upgraded. These bonus cash rewards are only earned on transactions originating from your Wells Fargo Cash Wise Visa® Card when transactions are made using a qualified mobile wallet (for example, Apple Pay® or Google Pay™). All other transactions will be processed at the base earn rate of 1.5%. To review the mobile wallets that qualify for the 20% mobile wallet bonus, go to wellsfargo.com/cashwisemobilewallet. Participating Merchants of the Earn More Mall® feature control the variability of the offers shown. Bonus cash rewards are earned on net purchases (purchases minus returns/credits) only. Review full Earn More Mall feature Terms and Conditions for all earning details. Your cash rewards balance includes cash rewards earned through your most recent billing cycle. Cash redemption options by phone or online are redeemable in $25 cash reward increments only. Cash redemptions by withdrawal from a Wells Fargo ATM or a rewards redemption to an eligible Wells Fargo account from a Wells Fargo ATM are redeemable in $20 cash reward increments only. You must have a Wells Fargo Debit or ATM Card in order to redeem rewards at a Wells Fargo ATM. Rewards redeemed as a credit to a qualified Wells Fargo mortgage, loan or credit product are applied toward your principal balance. You must still make regularly scheduled payments. Coverage is supplemental to Cardholder's primary insurance coverage. Entire rental transaction must be completed with an eligible Wells Fargo Cash Wise Credit Card account or rewards programs associated with your covered Account. Cardholder must decline coverage from the rental company to be eligible for this benefit. Certain vehicles are not covered. Certain restrictions and limitations apply. Please review the Visa Guide to Benefits for details. The minimum dollar amount that must be paid each month before the payment due date. The minimum payment amount may vary monthly depending on account activity; you may find your current minimum payment on your current monthly billing statement. Also known as credit line, this is the maximum amount you can carry as the balance on your credit card. Allows you to use the available credit on one credit card to pay the balance on one or more credit lines or loans. While making a balance transfer may be beneficial to you, balance transfers also may have limitations and/or fees associated with them so please consult your account agreement before making a balance transfer.